Get ready to step into the world of Cars once again. The funny talking vehicles are back to present you with an all new racer game, based on the movie. With death defying car stunts and cool cars, you can go any way you want to. So start your engines, and may the best racer win! 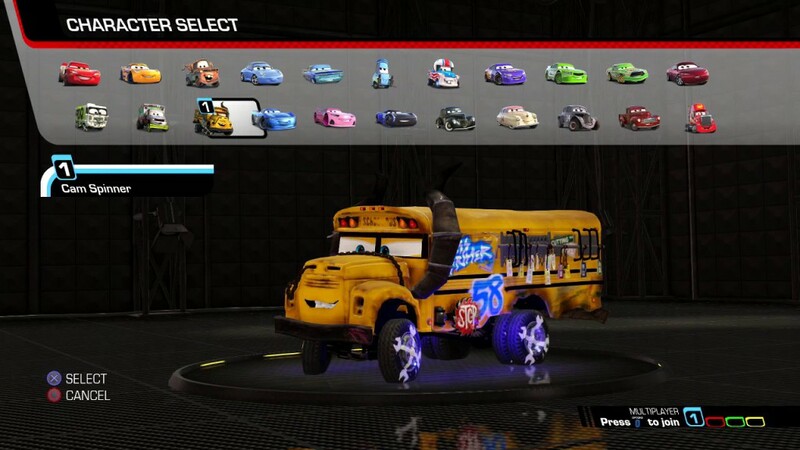 You start the game off with an intro video showing Lightning Mcqueen, Cruz Ramirez and two other drivers. This short video is an excellent beginning to show the setting and the track. After the clip, you get the first instructions on how to drive. First you learn how to jump and drift, while in the meantime some other cars get introduced. The story from the game goes on where the movie left off, so it is hard to guess what some things are about when you haven’t seen the movie yet. The next clip shows the real beginning of the story. Lightning gets told he’d be too old to race by a newscaster and a newer racing car called Jackson Storm, because his statistics aren’t what they used to be. Mcqueen tells them he wants to show them they’re wrong, that racing isn’t all numbers, but also comes from the heart. As a result, he challenges Jackson Storm to race. Jackson agrees and says that he wants to be a good sport by giving Mcqueen time to get ready. Nathalie is a car that is going to support you getting ready by keeping up records of how you are doing. Using the simulator, you need to get to the last level in order to race against Jackson, to show him racing does come from the heart. Since the Disney studios closed in 2016, Disney hasn’t released a new game yet. For Cars 3, they went hand in hand with Avalanche Studios. This is the first Disney game that is published by a non-Disney publisher. Avalanche Studios had to show their best in order to be able to work with them again, and they certainly knocked the ball out of the park when it comes to graphics. It is commonly know that Disney is a master at animation, and Avalanche certainly kept up their name. The short in-game clips are beautifully rendered, and the graphics during the game itself are brilliant too. Of course there are a couple glitches here and there, but really, the tracks and characters are beautifully rendered and really give soul to the game. As expected, all voice actors of the movie stepped in to voice their characters in the game. Every car has its own unique voice and looks. 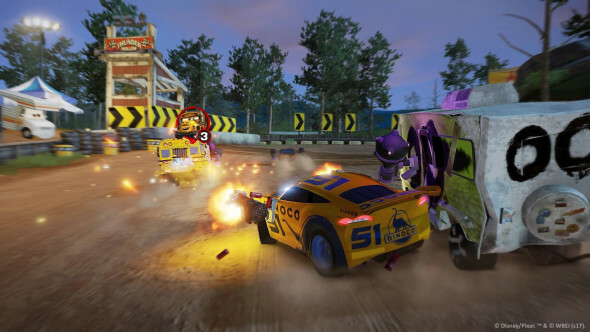 Next to the main theme, each racing track has its own music, fitting the environment. It is well thought out and well done. Battle race: racing, but with weapons. 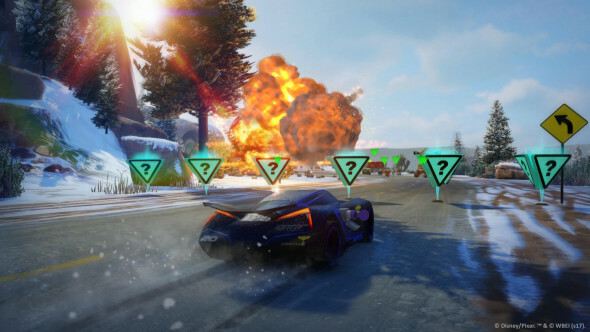 Takedown: use weapons and power-ups to take out as many racers as possible to earn points. When the time runs out, the one with the most points will win. Stunt showcase: perform jumps and tricks to earn as many points as possible. Best lap challenge: get the best lap time over a given course. Playground: a sandbox mode that allows you to race, perform stunts complete challenges or just cruise around. One of the great things about the tracks is that you can go off track to take some shortcuts. It does not count as much of a shortcut, but it can be fun to take a bit of the scenic route. The power-ups and weapons can be handy, but only if you are behind other racers. Also, the controls are sometimes hard to use, like riding backwards and shooting at the same time, which is almost impossible to achieve. The gameplay itself is pretty well done, but it raises some questions. The movie is only about racing, so why all the fuss about tricks? It seems a bit illogical. 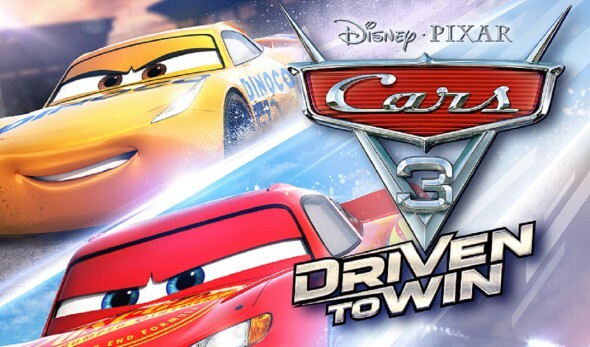 Overall, Cars 3: Driven to Win is a pretty good game to play for all ages. 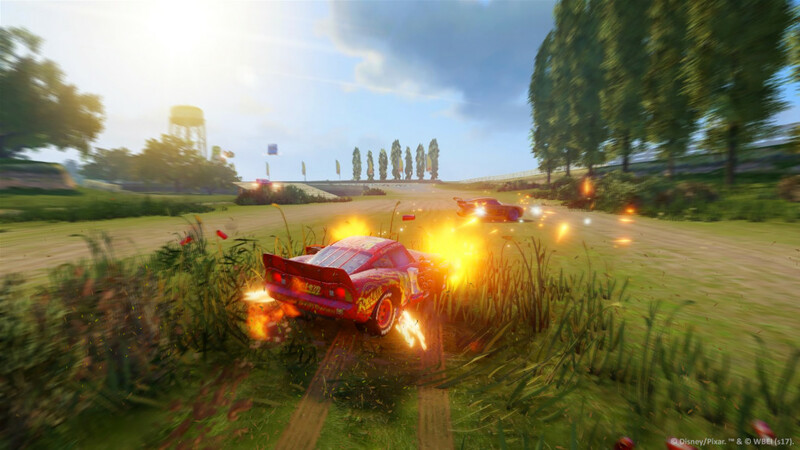 The name ‘’Cars’’ makes it especially attractive to youngsters, but it can also be fun for other gamers to play. The graphics and sound are done very well, making the game as visually appealing as the movie. The story does run a bit short. If you have not seen the movie yet, it can become a bit confusing as to who the characters are and why they do what they do. Also, as said before, it is a bit silly that they induced the tricks in the game. It feels a bit like they added useless whistles and bells.